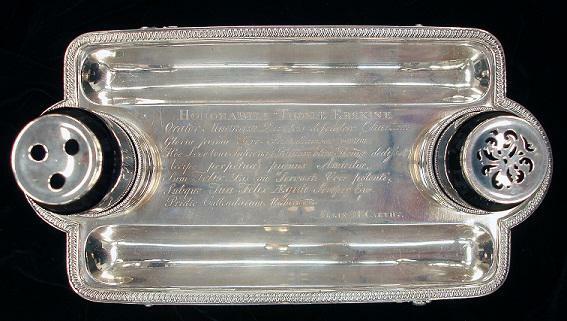 One of the many unusual items found in Special Collections is an inkstand given to the noted British lawyer Thomas Erskine by Felix McCarthy in appreciation of Erskine's rigorous defense of McCarthy. 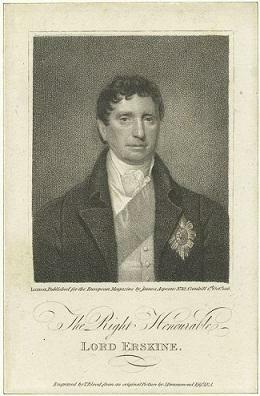 Thomas Erskine (1750-1823) (seen below in a mezzotint published in 1816, and engraved by T. Blood after a portrait by Samuel Drummond) held a reputation for impassioned defense long before this case. He was known as a people’s advocate and represented radicals and reformers, including Thomas Paine, in absentia, for publication of the second part of Rights of Man. Erskine represented McCarthy in the 1802 case Billett v. M’Carthy, 2 East 148, 102 Eng Rep 325. McCarthy was arrested and jailed in Fleet Prison after defaulting on a debt of £50 to Billett. McCarthy signed a cognovits, acknowledging Billett’s claim to be just, and was granted bail. He failed to comply with the terms of the note, and, in February 1801, agreed to pay £97 in weekly installments. Although McCarthy paid the first installment, he again defaulted and judgment was entered against him in March 1801. McCarthy was arrested in June 1801 and imprisoned at Fleet Prison. Erskine argued that the Insolvent Debtors Relief Act of 1801 (41 G.III c.70) applied to McCarthy even though the act was passed after his debt was incurred. The Act stated that any person jailed for a debt of less than £1500 should be released. Erskine was successful and McCarthy was released from Fleet Prison. Under your aegis, happy I will always be. The day before the Kalends of March 1802. 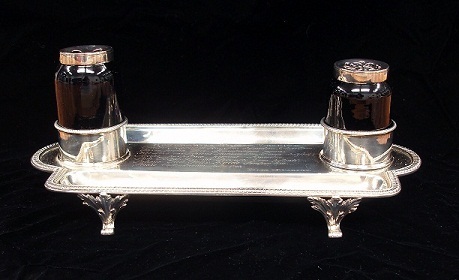 The sterling silver inkstand was made by William Pitts in London in 1802 and contains ink and ponce pots of Bristol blue glass. The gift, donated by Edward H. Forgotson (Class of 1960) in 2000, is on display in the Special Collections reading room (4.209). For more of Erskine’s orations, the Rare Books Department holds The Speeches of The Honorable Thomas Erskine (Now Lord Erskine) When at the Bar, Against Constructive Treason.